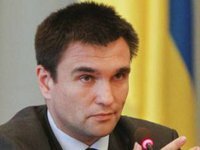 The foreign ministers of the Normandy Four countries (Germany, France, Ukraine, and Russia) at a meeting in Berlin, Germany, discussed the possibility of holding a meeting of the head of state of the Normandy format in the near future, Ukrainian Foreign Minister Pavlo Klimkin has said. "We need to determine if there is any sense for the meeting at the top level. We spoke today about the importance of such a meeting in the near future. We did not determine specific dates, but we agreed to work further to determine the general framework and leave two or three issues that have exclusively political significance for the decisions of the heads of state," Klimkin said at a briefing after the Normandy format meeting in Berlin early on Tuesday. "When we have such logic, we will be able to approach the summit," he added. At the same time, Klimkin said that in the issue of deploying peacekeepers to Donbas the positions of the foreign ministers "are in different universes." "We understand our agreements differently, we absolutely understand in different ways what the mission should be like. [Russian Foreign Minister Sergei] Lavrov insists that this should be the fake protection of the [OSCE] SMM," he said. According to him, the issue of political prisoners and exchange of hostages was also raised at the meeting in Berlin. "It is very important that [German Foreign Minister] Heiko [Maas] and [French Foreign Minister] Jean-Yves [Le Drian] received very special emotions after meeting with the relatives of hostages, so today we were together, pressurizing Lavrov and telling him that Russia does not want to take away Russians, does not want to talk about exchanges, does not want to really complete the exchange in Donbas, does not want to start searching for those who disappeared in Donbas, along with the Red Cross. In the end, Lavrov even admitted that this is not a political problem," Klimkin said.